Caltex Philippines ongoing Promo will let you gas up a new ISUZU D-Max, win StarCash Caltex Fuel and Ice Age 4 premium items. Caltex Philippines Cool Roadtrip with Isuzu Dmax Promo runs until September 9, 2012. For every 500 pesos worth of fuel and lubricant product purchased, Caltex customers nationwide get a chance to win a 4X2 LS MT ISUZU DMAX, plus a 20,000 pesos worth of Caltex fuel (StarCash) to be raffled weekly starting until September 13, 2012. A total of 500 Ice Age 4 premium packs are also to be given away as consolation prize. Register via the Caltex website (www.caltex.com/ph) by clicking on the promo banner. or via the Caltex Philippines Facebook page (www.facebook.com/CaltexPhilippines) and search for the promo application. Watch for the Announcement of winners via Caltex website and an FM radio partners not later than 6 p.m. every Friday as well as in all participating Caltex stations where winning names will be posted. Winners will also be notified via registered mail and through their landline or mobile number. Important, a major-prize winner can only win once for the entire promo period, but a customer may keep winning the consolation prize once per draw until drawn as a major-prize winner. For validation purposes, a customer has to present and surrender a copy of his thermal receipt indicating the winning Caltex 10-digit number and also shall present the registered mail sent by Chevron Philippines and at least two valid IDs. For more information on the promo, visit www.caltex.com/ph. 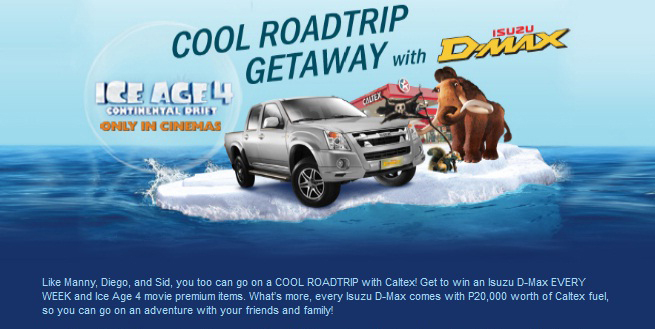 0 comments: on "Caltex Chevron Cool Roadtrip Getaway with Isuzu Dmax & Ice Age 4 Promo"